A box office is the place where tickets to events - such as movies or theatrical plays - are sold, although today the term is most often used in the film industry as an indicator of the success of a movie. 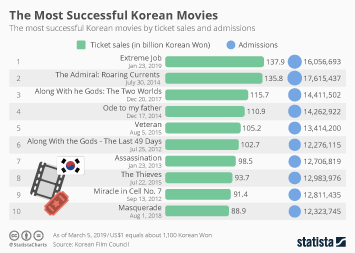 Box office revenue is the amount of money raised by ticket sales; a movie that “does well at the box office” attracts many people and generates a good amount of revenue. In the United States, box office data is closely monitored and reported for the domestic market (U.S. and Canada) and on a global basis. Movie attendance in the United States hit its peak in the early to mid 2000s. In 2002, 1.58 billion movie tickets were sold compared to 1.19 billion in 1990 and 1.34 billion in 2010. Total box office revenue has continuously increased, though, mainly due to rising ticket prices: inflation and the introduction of 3D movies brought ticket prices up from $4.23 in 1990 to $8.93 in 2017. The number of cinema sites in the U.S. has decreased since the mid-nineties but has been virtually stable for the last 5 years. The biggest cinema circuits in the U.S. are AMC and Regal with 659 and 566 sites respectively. The most successful movie at the box office, both internationally and domestically, was James Cameron’s "Avatar", with international box office revenue of 2.78 billion U.S. dollars. Notably, the second-most successful movie was also directed by James Cameron: his "Titanic" from 1997 earned 2.19 billion dollars at box offices around the world. The most successful movie of 2017 in North America was "Star Wars: The Last Jedi", highlighting the triumphant return of one of the most successful movie franchises of all time. Another film from the same franchise, namely "Star Wars: The Force Awakens", also posted one of the most successful opening weekend in history, earning almost 248 million dollars at the domestic box office in its first three days. Weekend box office revenue is highly relevant in the United States. Opening weekend performance of new releases is closely monitored and can often decide the fate of a movie.